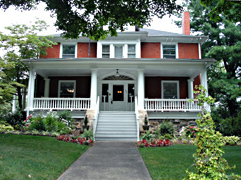 The Chestnut Hill Historic District is a compact late 19th- and early 20th-century residential neighborhood that began as the outskirts of frontier Asheville. Some buildings were erected in this area even before Asheville underwent its first growth spurt in the 1880s. The construction and population growth brought on by the railroad fostered the development of Chestnut Hill into a fine housing district. Far from being a neighborhood inhabited only by the wealthy, a variety of housing was built and servants and laborers resided here as well as businessmen, lawyers, teachers and other professionals. East Chestnut Street is a busy, tree-lined cross street bisecting the district, lined with large houses that represent the aray of nationally popular architectural styles of the late 19th and early 20th centuries. Respected architects R. S. Smith and J. A. Tennent contributed designs for many of the buildings, including the 1876 Courthouse (later the 1892 City Hall) conceived by the latter. Chestnut Hill's atmosphere and architecture also attracted several famous names of the day, including Senator Jeter C. Pritchard (later appointed U.S. Fourth Circuit Court of Appeals Judge) and State Attorney General Theodore Davidson. Enticed by Asheville's growing health retreat trend, Dr. Karl Von Ruck moved to 52 Albermarle Place and conducted research on tuberculosis at Winyah Sanatorium, located outside the neighbhorhood. Dr. Von Ruck's discovery of a tuberculosis vaccine and his scientific research brought much prestige to Chestnut Hill. During the 1920s, resident and nurse Anne O'Connell constructed another important building in Chestnut Hill--the Princess Anne Hotel at 301 E. Chestnut, which served families of patients at O'Connell's tuberculosis sanatorium. Chestnut Hill today is representative of the growth and development of the city of Asheville. Chestnut Hill Historic District is roughly bounded by Hillside, Washington, Broad, and Orchard sts. and Merrimon Ave. 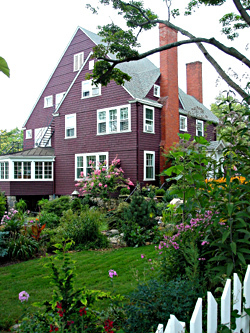 The houses of the neighborhood are primarily private and not open to the public. Commercial businesses are open during normal operating hours.